Text messaging – 92% of teens in romantic relationships spent time text messaging with their partner at least occasionally. Talking on the phone – 87% spent time talking on the phone with their significant other. Being together in person – 86% spent time together in person, outside of school hours. Social media –70% spent time together posting on social media sites. Instant or online messaging – 69% spent time with their significant other using instant or online messaging. Other common ways in which teens spent time with their romantic partners included video chatting (55% of teens in romantic relationships spent time with their partner in this way); using messaging apps (49%), email (37%) and talking while playing video games together (31%). Teens in romantic relationships may spend some amount of time with their partners in a wide range of venues, but text messaging stands head and shoulders above all other communication venues when it comes to the frequency of those interactions. Fully 72% of teens who have been in a romantic relationship say they spend time text messaging with their partner every day, a proportion that far surpasses any other communication channel in terms of daily usage. By way of comparison, talking on the phone is the second-most-frequently used communication channel among teens in romantic relationships, but just 39% of teens in these relationships talk on the phone every day with their significant other. 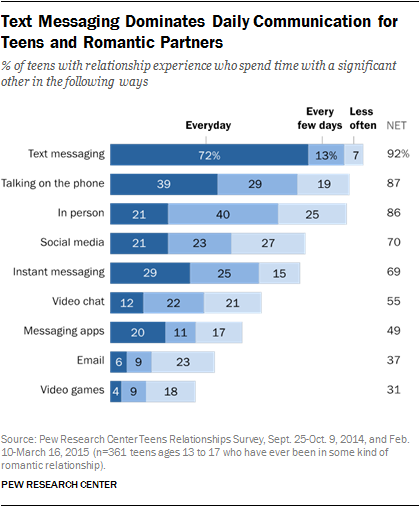 Similarly, 29% of these teens spend time every day with their partner via instant messaging, 21% do so via social media platforms, 21% spend time together every day in person, and 20% spend time together every day using messaging apps. Older teens ages 15 to 17 spend time with their romantic partners in a wider range of venues than do younger teens ages 13 to 14, especially when it comes to in-person interactions that are more feasible with the increased autonomy that comes with age. Fully 90% of older teens who are in a relationship (or have been in the past) say they spend at least occasional time with their significant other in person and away from school, compared with 75% of younger teens. Older teens are also more likely to report spending time with their significant other talking on the phone (90% vs. 79%), as well as using text messaging (95% vs. 84%). Indeed, 76% of older teens say they spend time with their partner via text messaging “every day,” compared with 62% of teens ages 13 and 14. Girls and boys tend to spend time with their significant others in similar venues and at similar frequencies. Girls use text messaging with slightly greater frequency than boys within the context of their romantic relationships (79% of girls and 66% of boys say they spend time with their significant other via text message “every day”); but overall, the vast majority of both boys (92%) and girls (93%) with relationship experience indicate that they spend time with their partner using text messaging at least occasionally. Teen daters from less well-off households use social media more frequently to communicate and spend time with their partners. Some 30% of teens with dating experience who are from households with an annual income of less than $50,000 say they spend time with their significant other by posting on social media sites “every day,” compared with 17% of teens from higher-income households who communicate via social media with the same frequency. But even as teens from less well-off households communicate with romantic partners via social media more frequently, overall around seven-in-ten teens from both higher- and lower-income households spend time with significant others on social media at least occasionally. Teens from these less well-off households are also more likely to communicate with a significant other using online or instant messaging. This is true both overall (77% of teens with dating experience from these lower-income households do this with their partner at least occasionally, compared with 65% of teens from higher-income households) and as a daily communication tool (39% of less well-off teens communicate with their partner in this way “every day,” compared with 25% of teens from higher-income households). Along with spending time together in a wide range of venues, teens in romantic relationships also share many types of content online with their significant others. The survey asked about 10 different types of content teens might share, ranging from silly to serious and from the everyday to the highly personal. Humorous or funny material leads the way as the most common type of information teen daters share online with their romantic partners: 85% have shared this type of material. General updates about one’s thoughts, activities, location or friends also are very common. Some 78% of teens with dating experience have shared their personal thoughts online with a significant other; 78% have shared what they are doing, seeing or eating; 74% have shared updates about happenings with their other friends; and 73% have shared information about their location at the time. Other topics that get shared or discussed online are weightier or more sensitive. For instance, half of teen daters have discussed difficulties with family online with their significant other, while 31% have discussed personal health issues in these venues. At the same time, discussions of religion or politics are generally not widespread: Only 22% of these teens have shared religious content online with a significant other, while just 10% have shared political content. Overall, boys and girls share similar types of content online with their significant others – there are no significant differences between boys and girls on any of the 10 types of content included in the survey. And although there are very few differences between older and younger teens when it comes to the types of material they share online in the context of romantic relationships, older teens are a bit more willing to share certain types of material. In particular, older teens are roughly twice as likely to share personal information about their health with a partner or significant other (36% of older teens with relationship experience have done so, compared with 16% of younger teens). They are also more likely to share information about what they are doing, seeing or eating (81% vs. 69%). Funny stuff (97% of teens who have met someone online have shared this type of content with a significant other, compared with 82% of teens who have not met someone online). What they are doing, seeing or eating (96% vs. 73%). Things they are thinking about (93% vs. 74%). Things that are happening with other friends (87% vs. 70%). Their location (83% vs. 71%). 65% have shared information relating to problems with their family (compared with 45% of teens who have not met someone online). 46% have shared information online related to their health (compared with 27% of teens who have not met a partner online). But even as they share certain types of content at elevated rates, teens who have met someone online are no more likely than other teens to discuss political or religious content online with their significant other, or to share information needed for school. Most teens in romantic relationships assume that they and their partner will check in with each other with great regularity throughout the day. Overall, 85% of teens in a romantic relationship indicate that they expect to hear from their partner or significant other at least once a day, if not more often: 11% expect to hear from their partner hourly, 35% expect to hear something every few hours and 38% expect to hear from them once a day. When asked about their partner’s expectations for communication, a similar pattern emerges. Some 88% of teens in romantic relationships say their partner expects to hear from them at least once a day: 15% say they are expected to check in hourly, 38% are expected to do so every few hours and 35% are expected to do so once a day. These expectations for communication between romantic partners are consistent across a range of demographic groups: There are no significant differences on either of these questions between boys and girls, younger and older teens, those from higher- and lower-income households or those who have met someone online and those who have not. In a darker twist on differing expectations around communication between partners, about one-in-five (21%) teens in a serious relationship say their partner tries to pressure them into responding to their phone calls, texts, emails or IMs “always” or “sometimes.” The largest portion (18%) of these teens say they feel this way “sometimes;” just 3% say they feel this pressure to respond “always.” About a third of teens (32%) say they feel pressured to respond by their partner “rarely” and about half (47%) say they never experience this pressure. Some 27% of teens with dating experience have used social media to keep track of where their significant other is or what they happen to be doing. Girls are a bit more likely than boys to engage in this behavior (33% of girls do so, compared with 22% of boys), while older and younger teens, and those from higher- and lower-income households are equally likely to do so. 70% have felt closer to a significant other because of conversations that took place online or by text message. 48% have resolved an argument with their significant other using text messaging or other digital channels that they were having trouble resolving in person. Teen daters of various demographic stripes—boys and girls, older and younger teens, those with lower and higher household incomes—are equally likely to say each of these situations has happened to them. 43% of teens with relationship experience have encountered a situation in which they felt that their partner was distracted by their phone when the two of them were together in person. 33% of teens with romantic relationship experience have discovered their partner or significant other was doing something online that was upsetting to them. Boys and girls are equally likely to report each of these experiences in the context of their romantic relationships, as are older and younger teens. However, less well-off teens are more likely to say they have encountered a partner doing something online that was upsetting to them—some 43% of those from households earning less than $50,000 annually say this has happened to them, compared with 28% of teens from higher-income households. Along with the experiences listed above, teens are using mobile devices to stay connected or share information even when they are not physically separate. Some 48% of teens with romantic relationship experience have texted their significant other while they were hanging out together in person. Boys and girls, younger and older teens, and those from higher- and lower-income families are equally likely to report doing this. Sharing a password with one’s partner can serve as a means of establishing trust and closeness in romantic relationships, and roughly one-in-five teens with dating experience (22%) has shared one of their passwords with a significant other. This is similar to the 19% of all teens who have shared a password with one of their friends. And as was the case with password sharing among friends, there are few demographic differences when it comes to sharing passwords between romantic partners – girls and boys, younger and older teens, and those from higher- and lower-income households are equally likely to do so.